winter/wintry weather – which also meant fewer treks outdoors. I read, stitched, knitted and also took a few photos of the sky and winter trees – have I ever shared that I like “naked ‘ trees the best? So much of their character is revealed with the sky as background. We watched a couple Super Bowl football playoffs and plan to watch the game with pizza and champagne. Years past, tho’ not recently, Norman’s had Super Bowl parties. On the 12th, I stumbled upon The Cleveland Symphony Orchestra’s performance on PBS! The pianist, Lang Lang, played my favorite Mozart piece: Piano Concerto No. 24. The entire performance was superb, especially the camera work. Watch here . Sunday the 27th and Thursday the 31st, I joined stitching friends. I thought I’d make a Waterlogue collage; the top row of photos, L to R, show knitting, and needlepoint. The bottom row features needlepoint, hand applique´and machine quilting on a wall hanging. 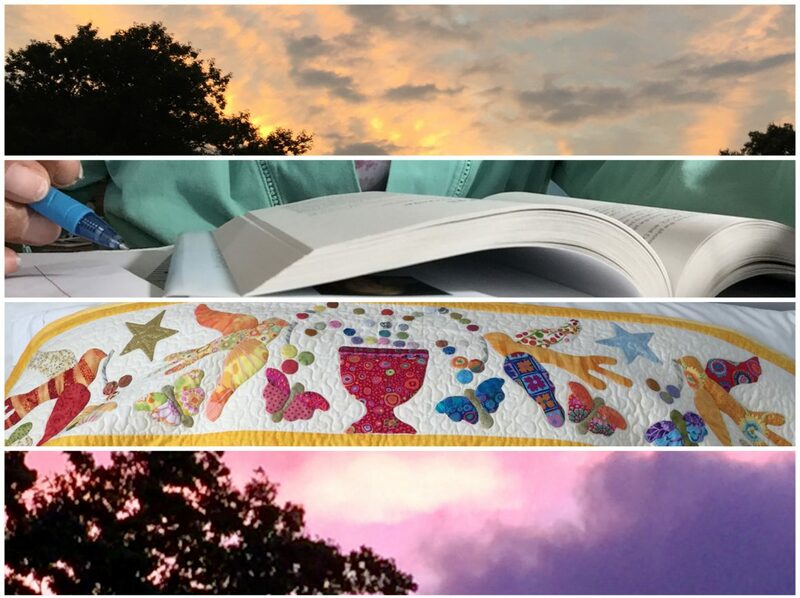 This is the quilt (lower right photo) – made by friend Diane- without the waterlogue. The quilt consists of gorgeous Asian fabrics, quilted with shiny gold threads. All very lovely. And that’s a wrap for January! We’ve had snow all day, since about 6 am this morning; it rather looks like it might be ending. Tomorrow’s to be sunny and 44° Guess ol’ Phil will see his shadow…We all know what that means! My friend Linda’ was coming from Portland OR; her flight, scheduled to arrive about 6 PM, was delayed in Denver. A quick check showed her flight’s ETA: unknown. Since I was so close to the airport, I called friend Pat (she lives about 10 miles from the airport) to see if I might stop by to while away the time. But of course she answered. About 40 min after I arrived, I checked to see if Linda’s flight status had been updated. On Time arrival! What???! Apparently the flight met up with a tail wind and therefore not only made up time but also arrived ahead of schedule! When I arrived at baggage claim, there was Linda! Friday, we lounged, er uh, enjoyed an extended Morning Solitude and Quiet Time. She was getting adjusted to the time change, the all-day before travel. I, well, I never turn down a chance to extend MSQT. Eventually, we got dressed and made a Whole Foods quick run, stopping on the way home at an Ethiopian restaurant for takeout dinner. Linda’s a big fan of Ethiopian cuisine (and actually prepares it tho’ she’s not Ethiopian). I hadn’t had Ethiopian cuisine in easily 15 years, so for me, the meal was truly a taste it again for the first time experience…and a yummy one, I might add! Saturday dawned early enough – a bit on the cool and dreary side – rain expected but we were ready with rain ponchos and boots, just in case. The March route was changed by the Park Service – we were not allowed to march on the Mall nor by the White House. There were many law enforcement personnel – both federal and city – and barricades: police cars; tanks; trucks; dogs; police on horses, etc. We marched and chanted and they watched, minding not when marchers stopped to take a photo with mounted law enforcement officers in the frame. At least 100,000 marchers was the official estimate. On the way home, we stopped at the grocery store for pizza fixins… and champagne and Talenti gelato. Sunday was pamper our feet day (I’d made mani/pedi appointments for us at Elizabeth Arden’s Red Door Salon); that took about 4 hours for us both. After, we went to Panera for soup and a sandwich and then to visit Dolly, Chris and Elias. Home, we joined Norman in watching the Super Bowl playoffs, finished Fri/Sat leftovers and we knitted. Monday, thus far the coldest day of the year (would you believe 3 – 13 degrees?) dawned too soon. Linda had an early afternoon flight home to the west coast. Unfortunately, her layover flight was delayed for 4 hours plus and she didn’t get home til 1 AM-ish PST! Home, I watched TCM’s showing of A Patch of Blue with Sidney Poitier and then started making a quilt. I sewed until Nightly News came on. We watched more TV and called it a night about 11 pm. Slowly today I am resuming normal life… doing laundry and a few other household chores… making a few more quilt blocks … savoring weekend memories … missing my friend. This weekend, we’re supposedly in for our first snow of the season…so, just to be on the safe side, we went shopping for ice melt and a few food items to tide us over. I suspect, based on previous experiences, if the snow does come, it’ll be short-lived…but then again, I could be very wrong! Only time will tell. If it does snow, I have plenty on my agenda to keep me company. Today, I tackled the clothes’ closet – finally! I feel so much better that I did…now, I need to finish clearing stuff off the bed…because it just might be needed for sleeping . The sun is setting, the moon is shining and homeward bound rush hour traffic is on the move. Have a great weekend! Fun: My friend AJ sent the adorable pillow… kinda looks like someone’s dog. I wonder who that someone might be – hmmm. Enjoy this last weekend of 2018. I’ll return the 31st. Christmas was filled with magic for one little boy and a chance for an older brother to show said little one, the magic of how this strange thing, called a toy, worked. We all gathered at the little boys’ grandmother’s – Mimi, as she is known! – for brunch that lasted throughout the afternoon! A grand time was had by all! Today, I’ve been up to my elbows in a much needed activity, purging stuff, aka döstädning – getting ready for 2019! Hadn’t realized how late it was until I glanced out the window and saw the sun was setting! Time flies when you’re having fun! Another day filled with blue sky and sunshine, tho’ a tad brisk out…but, who can or should complain? Certainly not I. A good day to run a couple errands: post office and a leisurely trip to Whole Foods. Feeling quite proud of myself for not buying any talenti gelato – t’wasn’t on the list and I did not even tempt myself by walking past the refrigerated section. Home. After putting away the groceries and consulting with Norman’s son re: N’s IE Explorer acting up… somehow the browser’s image size got changed to a teeny tiny 10. Michelle (Obama; I’m still listening to Becoming) and I took a brisk walk. She’s a great walking companion and had it been a tad warmer, I might’ve walked and listened a little longer. I’m not in a rush to finish the book – I’ve just finished the chapter on the night of Nov 4, 2008, when Barack Obama won the election for POTUS 44. I have very vivid memories of that night! My plans to give my nieces and sister each a copy for Christmas have changed: my niece – grand niece’s mother – beat me to the punch! Haven’t a clue about what to substitute…but, I still have time. Have you finished with holiday prep? hear the distant sound of a train’s whistle. I diced some of the red pepper and used the slices as garnishment. Hope you’ve had a quiet start to your Monday too. Have a grand day!